Nobel Peace Prize recipient and civil rights leader, Dr. Martin Luther King, Jr., said it well, the true goal of education is intelligence plus character. I agree with his 72-year-old assertion. Today, I present adding a third element to the formula—interpersonal aptitude. Interpersonal aptitude, defined as one’s ability to engage with others in a symbiotic exchange of intellect and character is an accelerant of becoming a better self. There are cases in which an intelligent, moral individual has an interpersonal bottleneck. Fortunately, interpersonal aptitude is not a constant and can therefore be taught and refined. To that end, we must infuse opportunities to foster interpersonal aptitude into our curricula and instructional practices; not as an artificial set-aside or afterthought, but as a part of our collective strategy to build not only an enlightened citizenry, but an affable one. So it is through equitable access to learning environments that classrooms become viable laboratories that cultivate individuality, collectivism, curiosity, and maturity. Laboratories characterized by opportunities for children to develop interpersonal aptitude through authentic engagement with peers of diverse cognitive abilities and from a diversity of cultural and ideological backgrounds. It’s not enough for students to collaborate with peers of diverse abilities and backgrounds—such an approach would be tantamount to machinated, garden-variety collaboration. Collaborative opportunities in the twenty-first century classroom must not be contrived. Rather, they must be authentic—in a way that the byproducts of collaboration are mutual respect, not tolerance; debate, not rancor; empathy, not sympathy; civic mindedness, not misanthropy. Schools would benefit from taking another look at what it means to be a collaborative classroom. Much of our practice has become informed by a constricted view of collaboration, which invariably manifests itself in classroom and lesson design, student grouping, problem solving opportunities, and technology integration. We need a look at the philosophy of collaborative classrooms—that which informs our behaviors as educators and our interpretation of instructional excellence. It is in the examination of our philosophy of collaborative classrooms that we might collectively engineer a more modern approach to programming and practice. All collaborative classrooms are not created equally. What might appear to be modern collaboration to the naked eye, might just be hollow group work with little or no subsequent impact on the development of intelligence, character, and interpersonal aptitude because of flaws in its design and philosophical underpinnings. To that end, a focus on collaborative activities and protocols (e.g., think-pair-share, assigning group roles, establishing group norms, the jigsaw method of organizing student groups) absent of a deep analysis of the philosophy that underpins the activities or protocols may inadvertently result in denied access to genuine collaboration. There are three types of symbiotic collaboration, each of which can be found in nature and empirical study on the survival of the fittest: parasitism, commensalism, and mutualism. We must ensure that our collaborative practices and protocols aspire to reach the north star of collaboration—mutualism. In a parasitic collaborative opportunity, one member of the engagement benefits and eventually the other member is harmed. One child becomes the host of the engagement and the engagement cannot persist without the host. This is demonstrated every day in our classrooms when we place a gifted or highly-able student in a group with a student struggling significantly to read, think, and write consistent with developmentally appropriate expectations. How balanced is the exchange of intellect, character, and interpersonal aptitude in this pairing? In a commensalistic collaborative opportunity, one member of the engagement benefits, while the other is neither helped nor harmed. This is demonstrated every day in our classrooms when we randomly place students into groups without using student outcome data to make the pairing meaningful. It’s a shot-in-the-dark approach to collaboration. One student might get what he/she needs from the paring inadvertently, but it won’t be as a result of strategy. To the contrary, mutualistic collaborative opportunities are characterized by both members of the engagement benefiting from exchange. This symbiotic relationship should be evident in our classrooms each day through a pervasively intentional approach to grouping as a means to ensure that every precious instructional moment is carefully crafted. These collaborations then support opportunities for students’ intellect to be strengthened and challenged; for their character to be developed by exposure to faces, cultures, ways of knowing and doing inconsistent with their own; and opportunities to play nice in the sandbox. The gold standard of collaborative classrooms is not about the protocols employed to engender collaborative behavior among students. Instead, the quality of a collaborative classroom should be measured by the philosophy from which activities and protocols are conceived. The offspring of collaboration will not be greater than their DNA. Donyall D. Dickey, Ed.D. will be speaking at the ASCD Empower19 conference on March 18, 2019. 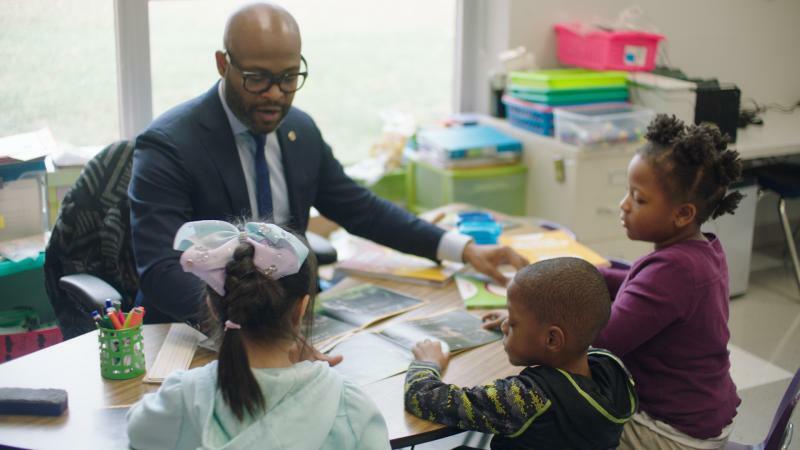 To read more about Dr. Dickey’s work, follow him on Twitter at @DonyallD and subscribe to his weekly blog, Dr. Dickey’s Epiphanies.